Tied with Ripple, BTC is not the strongest correlation BCH price has amongst major tokens though it is the 3rd highest, after LTC, and Ether, the prior being .89 while Ether is .87. The next highest correlation is for LSK at .8 and Dash at .79. BCH has a P-Value below .005 with all alt-currencies except REP, with which its correlation has a P-Value of .01. As non-crypto financial instruments go, BCH has a P-value of .11 with VIX, .63 with GLD, a .79 with TNX and .37 with the S&P 500. 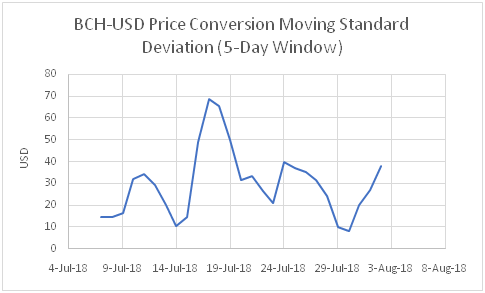 5-Day moving standard deviation for BCH price is reflected in the chart below. Dmitriy Gurkovskiy of RoboForex reports at Coinspeaker that BCH price experienced its fourth consecutive day of decline. He calculates that the resistance line right now is 776 USD. He concluded that the support line to watch is 700 USD. BCH closed August 2nd at 734.76 USD, according to Coin Market Cap. The support and resistance lines are determined by drawing trend lines along the upper bounds of the BCH price graph and along the lower bounds. Those trendlines, together, represent a price channel, which the BCH price is typically be expected to remain within until such time that it either drops above or below those lines to a significant degree, accompanied by a major change in volume. 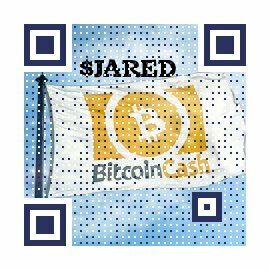 Collectively, this signals that the BCH price will now continue to trend in the new direction it is travelling in, with respect to the old direction. The upper line is called the resistance line and the lower line is called the support line. The tendency for BCH price to oscillate within the price channel is driven by the psychological impulse to buy as price drops close to a certain point, or sell if price rises close to a certain point. News BTC notes that lately, news about Cryptocurrencies has not been entirely encouraging. A technical glitch at HitBTC that shut it down may have contributed to bearishness amongst a wide swatch of crypto tokens. Paul Krugman, a contributor to the NY Times, and Economics Nobel Laurette wrote an opinion article in which he expresses reservations about cryptocurrencies, a piece of unflattering news that may have contributed to bearishness as well. Krugman’s attitude is that cryptos have no tether whatsoever, rendering them fundamentally valueless, in contrast to Gold, which has commercial use, and cash, which has value explicitly defined by the government that circulates it and charges taxes in denominations of it. His other issue with cryptos is that they are not easy to trade. It’s not just fees, also. To deter fraud, trades are inherently costly to verify, the opposite of the trend of history as he sees it, where transactions become more smooth over time as new monetary innovations are introduced. Around 9:30 ET, Coin Telegraph reported that BTC fell to roughly 7363 USD. They note that volatility has increased short term at the OKEx exchange, which is taking measures to “stabilize impending futures settlements.” “Bitcoin has traditionally seen downward pressure in the immediate run-up to futures contract liquidation from various operators.”, Coin Telegraph goes on to report. It is not all bleak news, however. Coinbase now offers an app that lets websites that use the WooCommerce eCommerce platform exchange cryptos, including Bitcoin Cash. 28% of businesses on the internet rely on WooCommerce. Mt. Gox creditors, meanwhile, are proposing that when Mt. Gox pays the roughly 1.3 Billion USD they owe to creditors and investors, currently scheduled to initiate next May or shortly afterwards, it be done in BTC and BCH to make it easier to use, would avoid crypto to fiat exchange fees and would lessen the danger of hurting the BCH price. This proposal can’t be applied until next February.